White Ibis: Prefers coastal salt marshes, swamps, and mangroves. Found along the Gulf Coast, mid-Altantic coast and Mexican coast and has become common in some city parks. Breeds as far north as Virginia and casual as far north as New Jersey, mid-west and Southwest. The White Ibis is a coastal bird species with pink skin on the face, bill and legs that turns scarlet during breeding seasons. This species flies in a straight line formation, and roosts in high trees and bushes at night. The preferred habitat of the White Ibis is coastal salt marshes, swamps and mangroves. 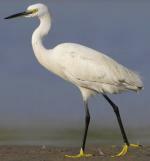 It may be found on the Gulf Coast, mid-Atlantic coast and Mexican coast. These birds have been found as far north as Virginia, New Jersey, and the Midwest and southwest regions of the United States. The conservation rating of the White Ibis is Least Concern. 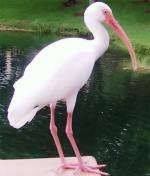 Around their colonies, ibises eat crabs and crayfish, which in turn devour quantities of fish eggs. 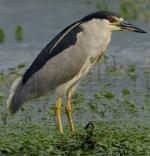 By keeping down the numbers of crayfish, the birds help increase fish populations. The main conservation concerns for white ibis are hunting and habitat loss. Birds and eggs are hunted for food. 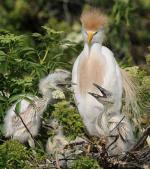 When the colony is disturbed by hunting, adults will leave their nests and the young may die. When feeding, White Ibis often give a soft, grunting croo, croo, croo as they forage. They may fly up to 15 miles a day in search of food. A group of ibises has many collective nouns, including a "congregation", "stand", and "wedge" of ibises.